English Fine Cottons has installed new machinery to increase our capacity to produce finer cotton yarns. Things are still evolving here at Tower Mill, and we’ve been taking steps to ensure we can keep-up with high-demand from the fashion industry. 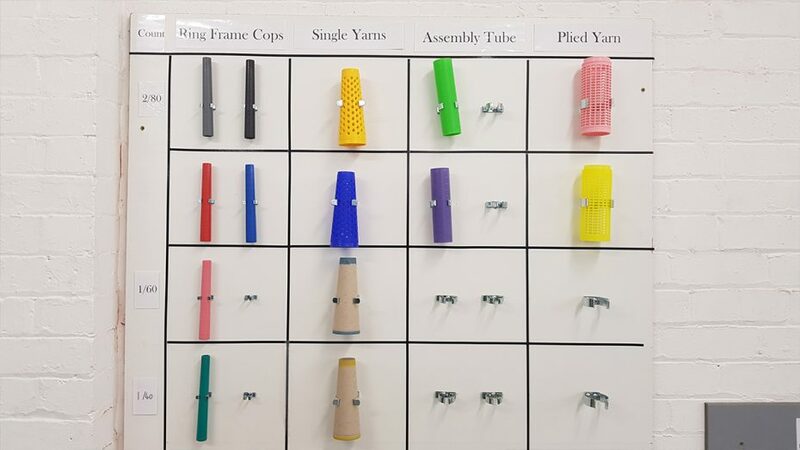 We’ve recently finished putting together our sixth spinning frame on the third floor, but most of the changes have taken place on the first floor, where our yarns are finished. This is where we’ve built four new doubling machines and taken delivery of a second assembly winding machine. These new additions will allow us to increase our production of high quality plied yarns. All of our finer yarns are made from extra-long staple (ELS) cotton varieties. We produce them in a range of ‘weights’ – cotton counts (Ne) – to suit different uses. Plied yarns in 40, 80 and 100 Ne are proving to be the most popular with customers looking to produce premium quality fabrics. While 40s are ideal for hosiery twists for knitting, 80s and 100s tend to be used for things such as shirting fabrics. Our production manager, Paul Storah, explained: “Finer yarns make finer fabrics, but for quality you also need regularity and strength. “At first glance, a 2-ply 80 yarn will look the same thickness as a single 40, but because it’s been doubled, it will be smoother, more regular and stronger. If you look closely at the photo above, you can see the difference between a single-ply 40 thread and a 2-ply 80. Our heavier yarns are often sold in single-ply. This means after they’ve been spun then checked and wound on to cones by the auto-coner machine, they are ready to be steamed, packed and shipped. However, our 2 and 3-ply yarns need a bit more work before they are ready to be sent out to our customers. After the steaming process, the yarn is taken to the assembly winder that winds the two ends of the yarn parallel around plastic tubes called ‘cheeses’. These are colour-coded according to the yarn’s specifications. After that, the cheeses are loaded on to an automated doubling machine, which will twist the two ends together to make a plied yarn. And this can be a long process – our luxury yarns need to be treated with care and the doubling machines work fairly slowly. The finer the yarn the more twist required – that is, the more turns per metre and the slower the yarn passes through the machine. Larger packages of fine plied yarns can take up to 100 hours to twist. All this work to the yarn means our customers are getting a truly premium product, which will reflect in the quality of the garment you buy. The fabrics made from our yarns will stay looking good for much longer.